Function：The Stretch device: Strengthen the strength of abdominal muscles. The rotation device: Strengthen the strength of arms and legs, and enhance the balance ability. Use：The Stretch device: Clenching the armrest firmly, keeping the legs straight and trying best to bend the body up. 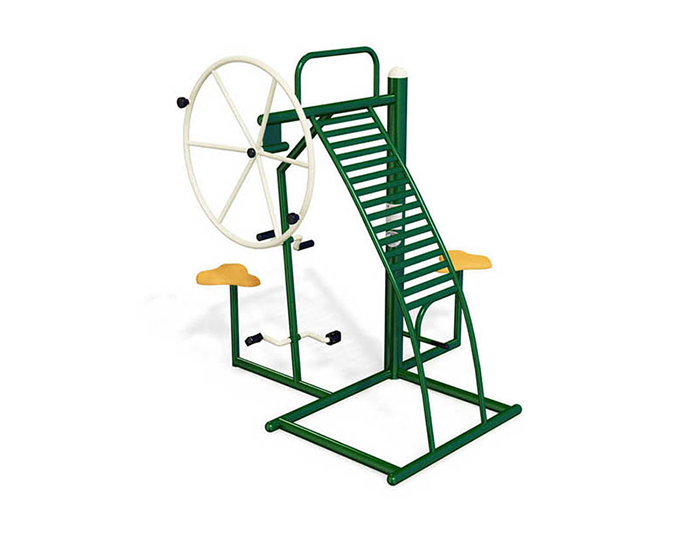 The rotation device: Sitting on the seat, pedal the feet on the pedals and rotating, rotating the arms accordingly. The twist device: Sitting on the seat, clenching the armrest with two hands, and rotating the waist. The big wheel: Clenching the hand lever of the big wheel firmly, rotating the wheel in clockwise or anticlockwise direction.